Mature deciduous and mixed forests near water source; wooded swamps. This is a common, medium-sized, typical owl that is easily identified by its call. It is not migratory. If suitable prey is present it is a year-round resident. In the wild they live about 10 years. In captivity they have been known to live up to 23 years. Adults are 17″ to 24″ long, weigh 17 oz. to 37 oz., and have a 38″ to 50″ wingspan. Females are larger than males. The head is round. There are no ear tufts. The facial disk is whitish-brown with a prominent, dark brown outer ring and 4 or 5 fainter, narrower, vaguely-defined, brown rings around each eye. The beak is yellow and is mostly covered by feathers. The eyes are dark brown. Feathers on the wings, back, and back of head are dark grayish-brown with buffy-white subterminal bars and edges. The tail is long and dark brown with 6 or 7 well-defined, pale brown bars. Feathers on the neck, chest, and belly are buffy-white with dark brown streaking. The neck and upper chest are horizontally streaked, the lower chest and belly are vertically streaked. There is a sharp break where the horizontal streaking meets the vertical streaking. Male and female plumage is identical. This is the only owl in Minnesota with dark brown eyes. All other owls in the state have yellow eyes. Great Gray Owl (Strix nebulosa) is a much larger bird, up to 33″ long. The eyes are yellow. The rings of the facial disk are more well-defined. The “chin” has a solid black patch. The neck and upper chest do not have horizontal barring. Great Horned Owl (Bubo virginianus) has prominent, tall ear tufts and yellow eyes. Northern Hawk Owl (Surnia ulula) has yellow eyes. The neck, chest, and belly have fine, horizontal barring. Short-eared Owl (Asio flammeus) has small ear tufts and yellow eyes. The neck and upper chest do not have horizontal barring. Mostly small mammals, including mice, voles, shrews, chipmunks, squirrels, and rabbits; also amphibians, reptiles, smaller birds, fish, crayfish, and invertebrates. The Barred Owl is monogamous and mates for life. It nests in a cavity of an old deciduous tree, often one created by a Pileated Woodpecker, or in an abandoned nest of a squirrel, Red-shouldered Hawk, Cooper’s Hawk, or American Crow. Breeding season is from March to August. The female lays usually 2 or 3, but as few as 1 or as many as 5 white, spotless, almost perfectly round eggs. The eggs hatch in 28 to 33 days. The young leave the nest in 35 to 40 days but remain dependent on their parents for food up to 4 more months. Came across some juvenile barred owls just across the road from the fishing pier on Snelling Lake. A couple of them seemed to be trying to catch bugs or something in the dirt. 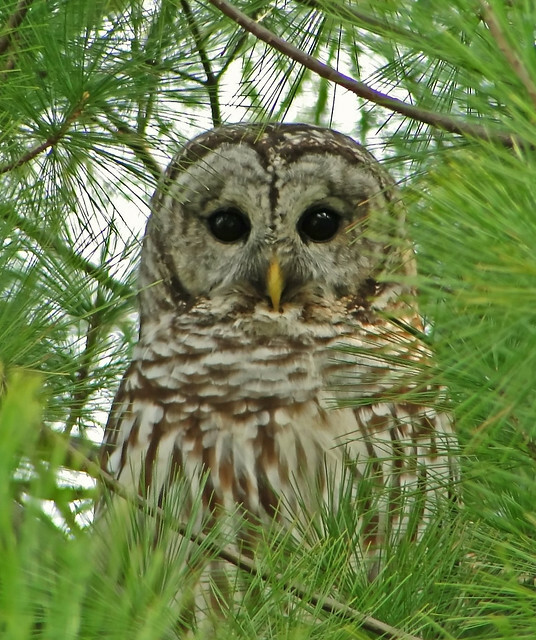 * Habitat: Barred owls prefer mature forests and heavily wooded swamps. They roost in densely forested areas, and hunt over farmland, open country, roadsides and rivers. They are often associated with red-shouldered hawks. * Video: by "Eleanor Kee Wellman"
** The Barred Owl is a medium-sized gray-brown owl that is streaked with white horizontal barring on the chest and vertical barring on the belly. They are round-headed with a whitish-brown facial disk that has brown trim. There are no feather tufts. The eyes are brown, and the beak is yellow and almost covered by feathers. The dark brown back is spotted with white and the long tail is crossed with six or seven sharply defined bands of pale brown. There is no difference in plumage between the males and the larger females. 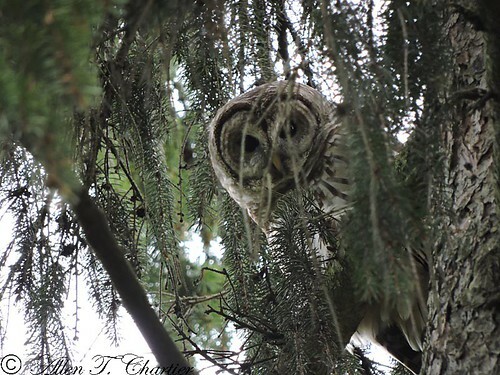 This chunky owl has dark eyes, dark barring on it's upper breast, and dark streaking below. It is chiefly nocturnal and its daytime roost is usually well hidden. Easily flushed, it does not generally tolerate close approach. It's call is a distinctive rhythmic series of loud hoots..."who-cooks-for-you, who-cooks-for-you all" also a drawn out "hoo-ah,"sometimes preceded by an ascending agitated barking. Much more likely than other owls to be heard in the daytime. Often a chorus of two or more owls will call back and forth. Have been hearing owl for years in our backyard. Hoping it nests! Am going to try and get some photos tonight. We heard an owl sitting somewhere very close in a tree while we were having a bon fire tonight. We searched owl calls and the Barred Owl matched. We heard it in the distance as it flew to different locations as well. Very cool.